The business school may alter this schedule based on instructor and space availability. If a course is oversubscribed, the business school will conduct a weighted lottery to determine which students will be admitted to the course, giving advantage to students who have successfully completed a greater number of courses in the program or are closer to graduation. All six business minor courses count for D2 distribution credit. Students who have taken a Business Minor course Pass/Fail and intend to graduate with the Minor must request that the Office of the Registrar replace the P with the letter grade earned before the final degree audit. All other Pass/Fail guidelines apply to business minor courses. 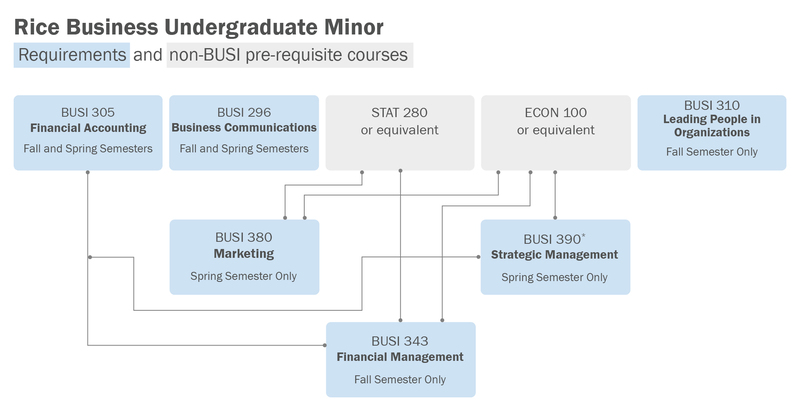 The business school’s grading policy requires that the average course GPA (including multiple sections where appropriate) should not exceed 3.50. For further information, please contact Rick Schell, Senior Lecturer in Management, at (713) 348-3321 or schell@rice.edu.